Archspire just announced they’ll be going on an American tour with Germany’s finest tech-death band, Obscura. Now we can report that the Canadian outfit will also be heading to Europe! 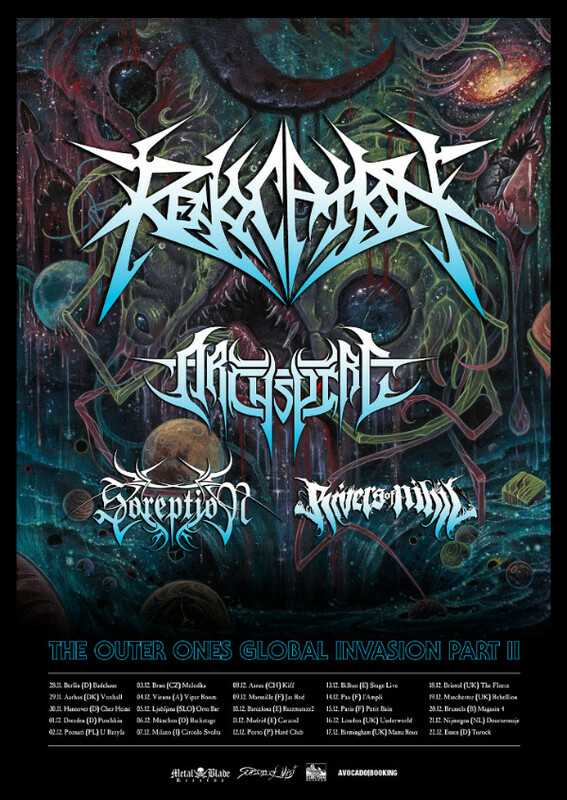 Attendants can expect a very heavy-hitting evening full of techy music, as Revocation will be the main band. They will have a new record in tow by that time; The Outer Ones is set for release on September 28th, and the band recently released a new song called “Of Unworldly Origin”. Further support comes from Sweden’s own Soreption. The band is going to play this year’s Summer Slaughter Tour with BTBAM, Born Of Osiris, Veil Of Maya, and more. Similar to Revocation, they are also about to release a new record. Monument Of The End drops on August 3rd via Sumerian Records; the first single off said record was just released. Take a listen to “Children Of The Automaton”. We’re glad they are finally coming to Europe this winter as part of this awesome line-up! As three of the bands already did or are about to put out a new record this year, we will get many brand new tunes on this tour. Archspire themselves will probably be focussing on their latest album, Relentless Mutation. Which band gets you most excited? Let us know in the comments! Also, be sure to follow all bands involved on their respective Facebook pages to stay up to date (Archspire | Revocation | Soreption | Rivers of Nihil). Next PostSpaceslug - "Eye the Tide"